I’m a sides kinda girl – sure the main course can be great, but I love a good side dish! (Just wait until Thanksgiving!!) So tonight I planned to make tacos and I thought all day about what else I could make to go with it. I decided I’d try to make Spanish rice (an old time favorite of mine). Although I had never made this from scratch before, I am pleased to say that my experiment turned out delicious! This is a really simple recipe and cooked while I was making the taco meat, so it definitely qualifies as weeknight-worthy. If I had planned ahead, I would have added some chopped red pepper (but I didn’t have any on hand). Maybe next time. But with or without red pepper, I think Spanish rice will be my new taco companion. Hope you enjoy! 1.) In a saucepan, heat olive oil over medium-high heat. Add onion and garlic and sauté for 4 to 5 minutes. Add rice, cumin, salt, pepper and paprika. Cook for about 2 minutes more, stirring frequently so that rice does not stick to pan. 2.) Add chicken broth and tomato paste. Increase heat to high. Stir well until the tomato paste fully dissolves. When rice begins to boil, reduce heat to low and cover. Cook for 13 minutes. Click here for my homemade taco seasoning. 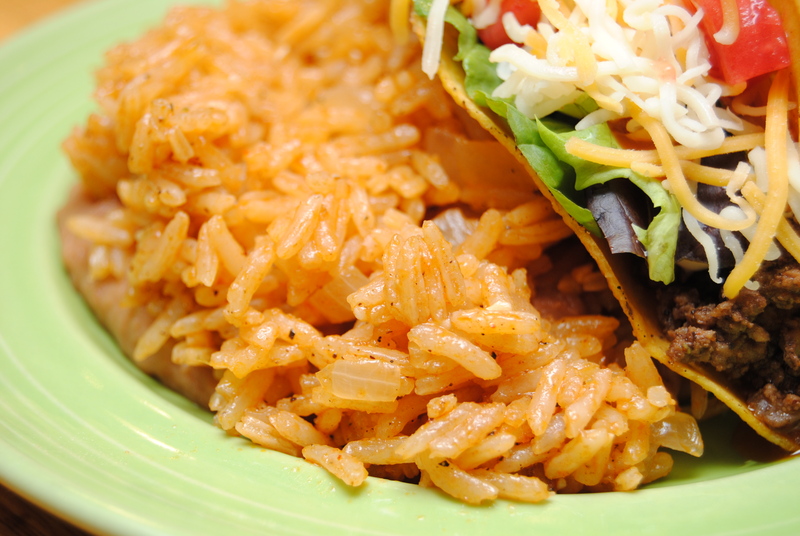 This entry was posted in Food and tagged Cook, Dinner, Food, From scratch, Rice, Side dish, Spanish rice, Taco by biscuitsncrazy. Bookmark the permalink. Does the rice need to be cooked first?